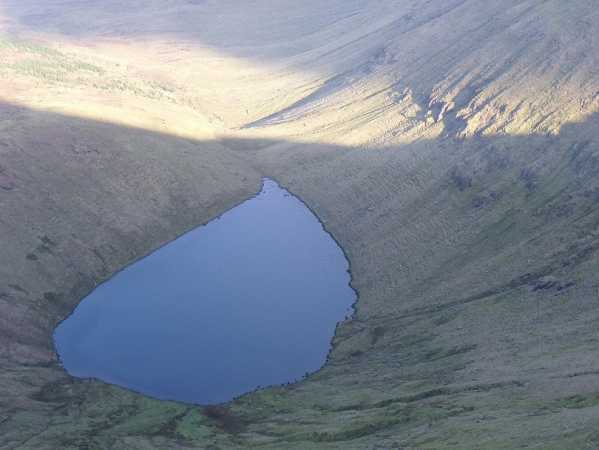 A scramble to Galtymore via Lough Curra wrings you out, so much so it takes the almost entire rounding onto the greater height to slake the thirst again. Looking back one sees why. It takes its own sweet steep time getting there. In one go, snail like, we went. There is not a soul to be seen, breeze-to-our-back-sun-on-our-faces-sort-of-bliss. The path ambles along the lip of this, almost kidney shaped dish. At one point of the route a little mounded ridge forms of the hags, the last straw for a defeated winter sun who could not make it over, tans one side in the mid-day bright, leaves the cold shoulder hard with frost. We go with the frosting. In no time we arrive to a broad tableau, secreted completely from view on the lower levels. Voices ventriliquate before their two young men, who bound up from a far side unaware of our presence. One of their two runs to the trig announcing the top of the world, which in this instance is quite accurate, it being the top of Galtees world. They shout hello above their own excitement, read their gps, strike a moments pose for camera, first at trig, next at the white iron cross, shots barely taken, they run diagonally past each other eager to see one or other vista first, and you understand completely. Given ‘this’ glorious sun, ‘this’ panorama beneath, ‘these’ skies, ‘this’ broad back from which to safely take it all in, given they got themselves here under their own steam, happy, happy day.